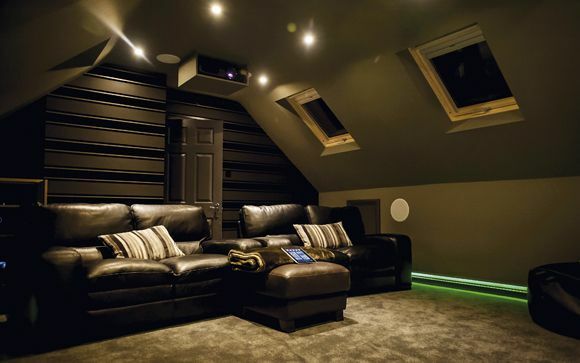 Not all custom install projects are largescale and premium-priced, as this compact theatre designed by Yorkshire-based Bespoke Home Cinemas illustrates. Given only a 3m x 3.2m space to work with (previously an unused spare room), the company set to business specifying a setup, around a relatively tight (and fixed) budget, for a film fanatic who wanted seating for four and a 'real' projector-led cinematic experience. In came a 5.1 speaker system, mixing Artcoustic front channels with SpeakerCraft surrounds and subwoofer and driven by an Arcam AVR. A wall-mounted 80in projector screen and Epson Full HD model provide the visual fun. Sources are a Blu-ray player, Xbox and Sky TV (fed via HDMI over Cat6 from the living room downstairs).